Toads in my garden, and toads on my porch. And even a toad in my family room. It seems that everywhere I turn, I am encountering toads – large ones the size of my palm, and small ones about the size of my thumbnail. 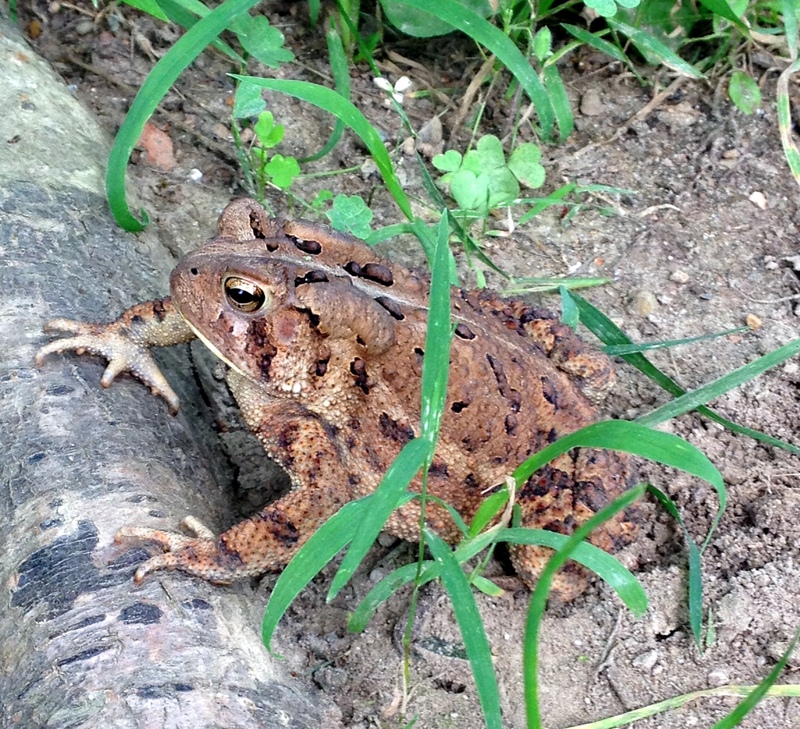 While weeding the garden I nearly grabbed a large toad in a clump of grass. And when I step out onto the porch I need to tread carefully so I don’t step on the small toads that come out at night. Toads have never been so evident. So, being interested in animal totems, I naturally wondered what the significance of toads is – what their presence implied in my life. I learned that the frog and toad totems blend, toad having most of the frog attributes but a few that are uniquely its own. Frog is primarily about releasing fear through transformation and rebirth – letting go of what no longer has value. Because frog transforms from a water being (tadpole) into an amphibian that breathes air (rebirth), frog bridges the gap between water and earth. Frog medicine will help one integrate water energy and earth energy—being both emotional and grounded – and symbolizes healing at the emotional, spiritual, and physical levels. Toad’s preference for a dry environment means that it exists primarily on the ground; toad teaches us to stay grounded, to face reality, and to control our emotions so they don’t control us. Throughout the summer months I have been struggling both on the emotional and physical levels with the intense output of brain power, communication outreach, emotions, and physical effort in contributing to an organization in which I am greatly involved. I feel like I am spinning my wheels and running in non-productive circles. As we approach our eighth year of providing a valuable service, I am burned out and frustrated. It seems that I am existing in a state of perpetual anxiety with my stomach churning and emotions out of whack. I am passionate about what our organization offers, but, it’s difficult being stuck when we have so much vision for moving forward. So the message from frog and toad is powerful – releasing fear through transformation and rebirth. Not only do I need to examine whether I remain in this spinning vortex, but I need to look at the transformation needed in the organization. If transformation in the organization doesn’t happen, do I allow myself to remain a pawn in the negative emotional and physical impact it has upon me? It’s two-pronged. So toad reminds me to stay grounded and face reality. Last night I partially stepped on a little toad as I walked out my back door and realized it before I injured it seriously. He seemed a bit stunned, but I moved him to safety, and when I looked a few minutes later, he was gone. What a metaphor. . .